Some people garden, we hold Craft Corner Deathmatches in our kitchen. Hey, at least it keeps us off the streets at night. I turned that cheese wax into a candle. 2. Break the old candle nubs into pieces with the hammer. 3. 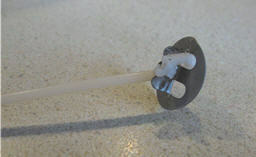 Wrap the wick around the metal wick holder. I wrapped my wick around the anchor as best as I could. 4. 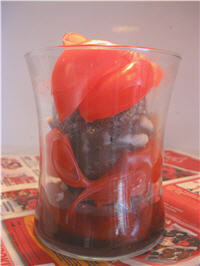 Place alternating layers of candle wax chunks and cheese wax chunks to fill your microwave safe candleholder. I started melting the wax before I took the photo. 5. 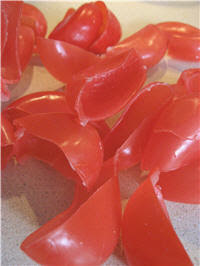 Microwave the wax in one-minute intervals until the wax has fully melted. 6. Use the potholders to remove the candle from the microwave. Caution: The wax may make the candleholder hot! Be careful, take all safety precautions, wear a helmet when biking, look both ways before you cross the street etc. 7. Put the wick into the candle. 8. 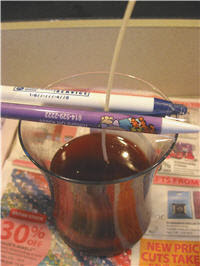 Place one chopstick/pen/pencil on either side of the wick to keep it in place while the candle cools. Let the wax solidify over night. 9. Remove the chopsticks/pens/pencils, trim the wick with a pair of scissors, and light your fire! Condo Blues Remake Your Swag Party! I am having a crafty creative reuse link party and you are invited! Have you gotten a free or swag item that you remade into something else because you did not want to be a walking advertisement? On the other hand, maybe you made it into something more useful to you because you wanted to be walking advertisement. Maybe you found that swag a new home by donating it to someone in need – that’s OK too. Write a post on your blog. On Sunday, August 22, 2010 I’ll put a linky up on Condo Blues and we can share in the clever craftiness, creative reuse or donations. Heck a photo of you or yours enjoying a swag item is OK too. It doesn’t have to be an item from a blog conference or blogger event. It can be anything, even some silly free gift with purchase item like these free beads I got on St. Patrick’s Day. but Blitzkrieg sure looks cute. If you are joining us from Something I Whipped Up Monday, Metamorphosis Monday, The Persimmon Perch, Market Yourself Monday, Made By You Monday, Marketing Mondays, Craftastic Mondays, Trash to Treasure Tuesday, Today's Creative Blog, The Girl Creative, Toot Your Horn Tuesday, Second Time Around Tuesday , Show and Tell, Tools are for Women Too, or Penny Pinching Party Welcome! I'm going to head off and give you a vote now. Good luck.